So here we go. 3.0. Harbringers, and hard nerfs hitting everyone. The good thing the nerfhammers missed the build mostly, so it's just fine in the league. Rules like you could have guessed changed a bit. 1. )No this build does not use headhunter, but can. And dreams about it everyday. 2. )Yes this build is very cheap (you can start out around 50c), most is the tabula cost, but still build heavily relies on quality of life improvments, so the difference can be dramatic with good gear and bad gear. 3. )Nerfs mostly scratched the power charges and abyssus, but hey, we are not the only one who feeling them, and those are not so important. 4. )Volatiles are no more, and that's the day every flicker strike build will celebrate in our bright future. Advanced late game tree, based around acuity gloves and high level. Leveling tree, showcasing the most important nodes and some tweaks that can be refunded later. Path of building raw code, showcasing the "lategame" character from the legacy league. And here is the BIG, NOTICE for you, so you won't miss it. When you finished the rest of the guide, went to the game, and died a few hundreds times. Go back here, and it will help you. Probably. Here i will collect the most basic and usefull mistakes and tips. Because hey. Nobrain flicking can't be hard, right? There is also an advanced tips and tricks part at the end of the guide. That's quite the same, but for more advanced and unimportant things. Take a note that those tips are mostly not for the final 100+exalts build form, but to solve actual problems that people have when trying out the build. For the most starting players the boss fight consists of ressurect at town message, and that part is about how to fix this. Rule №2 - Put your points into the hp nodes. Even the ones that don't lead to any notable nodes. And I'm not telling you to drop dps nodes for this. I'm telling you to farm maps of your tier for a day to get that 90+ lvl and have some spare points. Even 100hp can make a difference when it comes to oneshot or not, and with leech you don't even care if you was on 100hp if you are still alive. Rule №3 - Watch out for mods. If final kaom+acuity+96lvl ~6.5k hp build version can tank Vault golem boss slam with like +200% elemental damage -10% maxrez it doesn't mean that YOU can. And with flicker you WILL be hit by this. Sometimes it's better to reroll map properties to not die miserably. Do you think that to kill boss you just need to survive for some time? Think again. Cause it's not like that. Rule №2 - Control your frenzy charges. Preferably you must enter the bossroom with full frenzy charges, but this is still not enough. You are sustaining frenzy charges Only if you have diamond flask activated. Otherwise you are slowly spending them, losing even more dps every second. If you notice that you are spending charges too fast you can socket in increased crit chance in place of melee phys damage and don't forget to have diamond flask up all the time. Remember, if you run out of poitons AND frenzy charges, even if you still can flick, your dps is 4 times lower then it should be. Rule №3 - Control your flask charges.. Yes they are not infinite. And if you run out of flasks, you'll run out of frenzy charges too fast enough. And not only lose all you damage, but all you leech too. If you are in this situation. Keep calm. Turn 180, and run into the portal. Or you will die. But be carefull when you come back, because you will have to get your frenzy charges back. Rule №4 - Be aware of multibosses. It can be a map with two bosses (strand), any twinned map, or a map with just very strong summons (vault), you can think that the more targets the better, you have splash after all, but this is not the case. Flicker will go back and forth splitting the damage and will be much less effective. And worst of all you'll have good chances to run out of potions before even one boss will bite the dust, leaving both of them on low hp, but it won't help you in your current state. There is not much advice that can help you with that, apart of just getting stronger. But if it seems that you can't get stronger and desperatly need to get through this part of your life you can use 5-6l cyclone setup. Cyclone-Fortify-ConcentratedEffect-MeleePhys-ElementalDamage-IncreasedCrit\AddedFire. Even if you have to sacrifice kaom for ordinary 6l for a time to pass this stage, it can be worth it, because cyclone don't have drawbacks of flicker and can even allow you to dodge some of the strong attacks. Still without potions your dps will drop hard, so you should remember to finish the fight fast. That's pretty much it for the bosses. It's not as easy as it seems. All your dps is focused into the first 4-5seconds of the fight so be prepared to dish it out while you can. After this you dps will diminish fast, and if the boss is not low enough by then. You better run. I've already said enough about how important flask duration is in boss fights. So I remind you that if you use SoulThirst belt you actively REDUCE your flasks duration. Weakening yourself on bosses even more. So if you are having hard time with flasks, you can try to switch SoulThirst belt for Retch belt and place some points into mana\flask nodes near ranger starting point. This will make your life on bosses that much easier just by slowing you clearspeed around the map just a little bit. That's not all of it. I'll make adjustments into this part as well as advanced part. Hopefully adding some short and simple video examples. So for now, a quick demonstration. Here is the example of my gear early in harbringer league, to give you some updated view for what you should aim for at the start. But in terms of gameplay preview example of my character gear early in the legacy league is still accurate. In terms of this guide the gear and video below represent so called midgame character setup. And here is demonstration of this setup in motion. Well... See it for yourself. I'll upload some fresh videos as soon as I get to some descent level in the league, and this time i hope to do a bit more diverse presentation. But actually i came to conslusion that this version is not safe enough for leveling. So i eventually came up with this setup. If you want to play even safer, then you can use. They will give you everything you need, except rampage though. But it's not like most have much of a choice in harbringer league where shadows and dust are hard to find, and the next up are evern more expensive. Not only they provide utility, they can help you to free up to 5 skillpoints. My current tree on 94 lvl with them look like this. The core of the build is Terminus sword. After the rework it will give us insane attack speed and truly infinite frenzy charges. It have some manaleech issues though. There are many people asking why you need Terminus AND raider ascend at the same time. And the answer is pretty simple. One flickerstrike even with multisrike is only one attack, so you can get only one frenzy at best. This way any terminus build must have another frenzy sourse anyway. But here is the main dish of the build that make all the difference. It's inspired learning jewel. We are using it in the right jewel socket. As you can see in the video even one of those gems can make a tremendous difference in the clearspeed. The second one can be placed in the southern jewel socket while picking up some max mana nodes, that are crucial to mana sustain of the build while it don't have acuity gloves. Also there is a viable way to activate a THIRD inspiring learning jewel by using the nodes like this. Use it if you are aiming for maximum meme build. Just do it. Or just get a headhunter already. The Shadows and dust gloves are good (and even gave the build it's original name with their awesome rampage mechanic), but don't worth their cost now. Shaper's touch gloves, or some rare gloves are the way to go for you right now. They will give you lot of hp from dex, some mana and nice passive damage boost. As a body armour it's preferably to use Kaom or Belly of the beast for added health, and if you have 6link sword kaom is much more prefered. (But be aware that kaom will requre 191 strength to just pick it up) Or any other 6link armour you can get your hands on. Be careful with socket colours though. If you have a clearspeed brain malfunction, you can try to use Bronn's Lithe body armour that will give this build around 20% dps boost and even more movespeed. We also use darkray boots for added movespeed and frenzy charge, you can use kaomroots in early game for more safe leveling. They will give you more hp against oneshots and stun imun that is invaluble in the flicker builds. They both can be +1 frenzy corrupted as well. Abyssus still give you an insane damage boost and it will be hard to swap it for something else, but the insanity of the boost is much lower this league. So if you are feeling unsafe with it you can try out rare helmets, or even something entirely else, like rat's nest. That gives us a very strong souleater mechanic. It's a bit hard to use, but can make your clearspeed a bit faster. But be warned, that reduced flask duration can hurt your boss fighting ability in turn. If you struggling with bosses, you can go for the Retch belt. This will increase the flask duration greatly allowing for more slowpaced fights and give you some bonus damage without much harm to your hp and resistances. You can also try out. 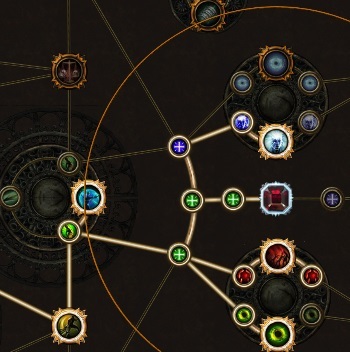 Bisco's leash belt for the strong rampage mechanic. It's a risky choice, because it doesn't provide health bonus and rampage mechanic is hard to sustain on bosses, so it's also hampering your bossfight potential. Around the same time you can put on Mantra of Flames Jewel at least temporary. It can help with you damage early on. The damage boost multiplies by the number of hunted mods you have. If you go fast enough the boost can become pretty large. Don't rely on it too much though. Most of the time it'll be replaced by strong %life rare jewel to improve the stability of the build. Other gear is really simple. We need health and resistance. That's all. No special fancy dps stats. Also strength and int stats are good too because, build have almost no int nodes at all and you need some basic int for gems. Some unique items can be swapped out to cap resistance and gain health, it all depends on your playstyle. Flask are pretty obvious mostly. Diamond flask is a musthave because we are greatly dependent on our crit rate, and it's not only about dps, but about clearspeed. We can't go forth if we haven't crit a mob to instakill it and so flicker strike will stutter flicking back and forth when you don't have enough critrate. You don't want to decrease you clearspeed with this and you probably don't want epilepsy too. But i need to point out Vinktar that is REALLY helpfull for our build, making us leech istantly any damage from phys to lightning gem and greatly increasing our damage output. It was nerfed hard this league. But it's still usefull with it's huge leach boost that helps you to stay alive. Elepen Vinktar is a bit better then others, but the diffrerence between convert and pen one is very small, also you will have 100% ele damage with convert one as good or bad as it is. Lion's roar have knockback strangely synergized with cyclone and give you a great dps boost all in all. Taste of hate is optimal for the build because we have cold damage nodes and it's phys reduction and maxcoldres are nice things too. You can use an Atziri promise flask till the midgame. It works fine with the build. But most of the top tier flasks are overshadowing it eventually. You also can use Basalt flask in place of Atziri promise for increased survivability. We don't use any life flasks in lategame because our leeching mechanic is so strong that you are in dead or alive situation most of the time, you just won't have time to press flask anyway. But don't forget to bring at least one or two in the early game, because you don't want silly deaths to some chaosdots or traps. Gems are a bit more complicated. We use warchief totem for more damage buff, but it have some nice dps too if placed near the boss and supported by at least some gems. Ice golem for added crit, either manually or by cwdt. Vaal haste is still usefull, but was nerfed hard. If you are not using enduring charges, you can use cwdt immortal call to not die horribly from some nasty things (be carefull. If you are using end charges - get rid of immortal call setup because they will interfere hard). And we use two gem setups for our two main skills. Flicker will dominate the lategame part while cyclone is the early game way to go. Don't forget to get leapslam too, to move over terrain. Mana reservation consist of Hatred because we already have scaling of cold damage and want to shatter enemies. And Blaspemy assasin mark not only for added crit chance and power charges but for 20% more crit damage mostly. In the early game you can go for hatred+herald of ash, because it's hard to sustain mana with that much of the reservation. But enlighten gem and some mana nodes can solve this issue. As far as bandit choice goes, I'd say go for Alira as you first character. Those 15% resistances are very sweet in this build, because struggle is real. Crit and some manaregen are really nice too. In the late game you can switch to Kraitlyn if you want to minmax your dodge and movespeed stats. As your main god choice I can recommend the Brine king for early game to avoid chainstuns and freeze if you still not passed UberLab to get your last ascendancy. For the mid\late game it seems that Solaris is the best choice to avoid chainCrits, get some resist in longer bossfights and somehow reduce sudden elemental bursts even though most of them can be avoided now. For the minor gods its probably Gruthkul for lesser phys reduction and slow on bosses. You can try to use Tukahoma, because you count as stationary while flicking. But if you are playing right, there wouldn't be much time while you are stationary even with this. I already started out on few leagues with it, and made this build work, so can provide some tips of what do you need for the start. Here the sample of leveling tree, with passives that you need to rush for somehow comfort leveling. We will get frenzy charges after normal lab so we can put them to use at once. So to the actual leveling. Up to act 6 or so we are using dual rapiers setup. We take Frost Blades from the start as our main skill and link it with added fire\elemental damage + faster attack + melee damage. At act 2 we pick up herald of ash and Hatred a bit later for mana reservation. Then we go up to act 3 with it and switch out to blade flurry with almost same gem setup. That would be enough to kill cruel Izario when we get to around act 5. After we have some spare currency and preferably tabula, you can straigh up buy terminus and start flicking. But be carefull it can turn out to be a real corpserun if you are taking on something you can't deal with. But be patient it's not for long. You are improving faster then mobs, so eventually you'll be satisfied. You still want to use cyclone for act bosses most of the time with links like. Cyclone + Increased critical + elemental damage + melee damage + physical to lightning + fortify. Don't forget to get diamond flask it's uptime is CRUCIAL to the build. With this we can sustain fortify and generate starting charges with cyclone while flicking constantly, flick can have manaleech problems on single targets, so you can switch to cyclone from time to time it still has good dps and much safer. Items that are good for leveling. Well this thing is just lifesaver. Resists are nightmare in the early game, and we have many uniques and low lifepool that make it even harder for us to survive elementals. I really recomend this cap for a long time, don't be lured into some good looking dps hats in the begining. We MUST cap our resistances to survive. Can help you to deal with those pesky resistances increasing you damage and gaining some utility at the same time. You will probably have exactly around 200 strength with a belt on. It have everything that we need except resistances and gives us free onslaught to speed up our leveling. Anyway - great choice... but hardly possible in this league. It will give you another dose of resists, and solve any manaleech problems caused by terminus attack speed. All in all it's a good "nobrain" pick. You will lose some res and hp from potentially good rings, but if you are going for assasin mark blasphemy early on it's probably you only hope to sustain mana. As I already mentioned before they are a gret survivability item in the early game. If you go for more agressive gem setup and don't have good hp rares you will be stunned and killed a dozen of times. Those boots can reduce this number quite a lot. Nothing to say except that you will be annoyed with their awesome movement speed, you also probably want to switch them whey you are going against traps, they won't help you with them. It's an instant hybrid flask that already make it easy choice if you don't want to roll yourself a good life flask. But what makes it special for the build is that you can generate charges on warms it spawns. It makes for an easy chain start, and helps to sustain charges on bosses and on the move when there no enemies around. This flask should still be replaced in the lategame but can become pretty handy to some of you. Well the first thing that i have to mention here is that we have converted elemental skills that already ignores physical reflect. And elemental reflect is not as strong as it may seem, so if you remove phys to lightning gem from setup you can deal with it most of the time dodge helps with reflect too. In the mid\late game you can actually pass the elemental reflect maps without changing anything, just try not to AOE too much, because the only real danger is to oneshot yourself with one good crit. Noleech maps are the worst part, so avoid them if possible. Leech is the core mechanic of the build and can't be ignored. It's possible to pass that mod, but you need to be strong and lucky. The bad mods also include Enfeeble that lowers you dps and sustain hard and elemental weakness, that can be hard to overcap with that much uniques, they are not crucial but just unpleasant. Avoid if possible. Build can do any other map mods up to tier 15 on shaped maps. But for maximum comfort you should shape you atlas accordingly. You don't want to waste you time and exp trying to take down twin core bosses with flicker or something like this. That build is not intended as guardian killer, but as tested actually can kill them. But i'm not advicing you to even try. You death is only one bad luck hit away. Here are some tips to git gud at flicker. Most of them don't have anything with build and items. But i've seen a whole lot of people that ignore them. And i'm talking about like 90% of new to flicker. 1. )Place flicker skill on the keybord. Just trust me, you hand will break after few days if you try to hold mouse button while flicking around. I'm using R button personally, because it allows for a good reach while holding it. It's a very common mistake. Flicker won't allow you to move after the flickchain is over if you don't release the move button and press it again. The result for the most players is that they getting stuck in place for half a second after each mob pack loosing precios time. To remedy this you should release the mouse button not after you flickchain is over, but while it's still going and get ready to press it and move again as soon as it's over. It may seem not much, but it's improve clearspeed quite nicely making your experience much smoother and enjoyable too. Those videos showcase that difference. I'm not using potions in those videos, to slow down the killing part a bit. Usual aproach, that I've seen too many times. Notice the staggering after each monster pack. Advanced aproach involving mouse clicking constantly, or at the right times. Notice that staggering is gone, and character moves instantly after the last flick. Also a very common mistake. A lot of new guys are getting overwhelmed by the loot ammount and spend all their time gathering wisdom scrolls in rows and checking out rares. It perfectly fine with most of the builds, but in this particular build you always on timer, hunted mods are expiring, frenzy charges are expiring, and if they run out, you are practically naked and can die each time. Don't let the loot to defeat you. Install the lootfilter today! And configure it by hand. Also extra tip if there is still too much loot and it getting messed up you can press Z two times to sort it out on the screen. 4.) Use all you potions at the same time. You don't need sustain. You want to become the strongest you can for a short burst. Don't forget that if you can kill enough in duration of the pots you will refill them in a moment. Also souleater belt encorauges that. So you must drink all you pots at once before boss\large pack with the longest time flask (diamond probably) last. Don't forget that the longer last flask lasts, the stronger will be souleater effect. Don't press flasks too often because of that too. 5.) Don't forget to use quicksilver flask. The worst that can happen to flicker is to be left out with no mobs around. That's why you must shape you atlas. That's why you gotta go fast to find mobs before charges and mods run out. And here quicksilver will help. Use it as often as you can. If there are mobs around, you will refill it. If there are no mobs around all more reasons to use it. 6.) Get antibleed on diamond flask. With everything said before you should have guessed, that diamond flask should be activated at all times. And with alligment resistance from ascendancy all you have to deal with is bleed. And with 100% flask uptime you don't even have to worry or look for it. You just doing your thing, and you have bleed immunity at all times. 7.) Proc fortify as often as you can. Hey, the boss just oneshotted me again! Goddamn it abyssus! I can't do anything! You can. You can proc fortify. But you forgot to do it again, right? 20% reduced damage is huge. It is the thing that stands between you and miserable death in early\mid game. If it's early game you can have it on cyclone and proc it as you want. In the lategame it can be in your main link. Another related tip is to not go full retard, and always remember that vinktar will shock you. So you want to proc it after the first hit on the boss when you get aligment immunity already, or you will die to oneshot. 8.) Use the ancestral warchief on bosses. It's won't take you much time to place one, and he actually have descent dps, distracts mobs and gives you a nice dps boost concerving some of your frenzy charges, all in all it's nice. Use it. Well you know. Use it. With faster casting linked and cast speed from frenzy charges cast time is almost instant. So all in all this build challenges the main staples of the clearspeed: vaalspark and discharge. And it have much, MUCH less budget cost. Also it's really fun to play because it's adapting to every map and to every playstyle. You can feel the build and you surroundings collecting everything you need at the same time. Build is perfectly fine for Harbringer league. It haven't lost much with 3.0 nerfs, because most of it core features weren't "mainstream", and Flicker can cover all harbringer summons in a matter of moment totally anihilating them. So you don't have to waste much time chasing them around the map. I hope you enjoyed this. Let's meet up in yet another league and good luck to you. Headhunter. Just a question, what are your choices for the bandits during the leveling phase? They are pretty obvios. Oak for life, we had a lot of uniques so that is crucial. Craitlyn attack speed. Most flickers pick phys damage but headhunting gives us so much damage already that we need only clearspeed from attack speed, and we don't have to worry about frenzy with terminus. And Craitlyn again for Frenzy ofc. We are the flicker raider after all. We actually don't need double dipping poison at all. Everything except guardians and maybe top tier t15 bosses (core, forest, colosseum) that are non existant in good shaped atlas dies within second, especially if you are fast enough to kill the boss before rampage expires. We are picking raider because of the speed and status immune only. Assasin is just a waste of time. It's slow and offer little help for farming. It will demand lots of status effect remove flasks or will die on strongboxes and random hits. We are using cold+lightning convert and hatred too, and we doing it so that we can't be killed by corpse explosion porcupines and other thing that we can shatter, also damage is enough to shock rare mobs. So poison have even less effect, because it's still slow going and doesn't fit flicker at all. So all in all damage is strangely not the main concern of that build. Speed is. I'm pretty noob and I just learn of flicker strike and it seems awesome. I looked at many different builds and I can't even tell any difference btwn them. Yours looks awesome don't get me wrong but I can't really tell it any different from something like this (https://www.pathofexile.com/forum/view-thread/1759669) or this (https://www.pathofexile.com/forum/view-thread/1819151) which also seemed pretty good. Could you possibly tell me how yours differs if you don't mind? Also what should I use to level and when can I start using flicker? First guide is well... Not much of a guide. It's VERY expansive build that flicking with mirrored daggers stomping the mobs with pure overgear. It's performing nice and smooth when it has around 50exalts+ gear but will be a horrible start. You can as well go blade flurry for this guide and not much changes. The second guide is a classic terminus Slayer without any twists. It's a solid choice. And slayer has around 25% more damage base then raider variant as well as more health. But he is 1.5 times slower then the raider and have a hard time using the mechanics that are core of my build. Also the antistatus flask problems and no vaalpact. Core of my build is headhunting mechanic from inspired learning jewels and rampage from gloves. Most other builds even with flicker have a hard time keeping up with rampage timer. Raider is fast enough to kill all monsters on the map in one rampage streak so it gives insane dps boost mulitplied by headhunting mods. Actually we achieving same and ever more speed and power from the mods as in the first guide you posted but not with the pure gear but from other niche mechanic that we have access too. We are leveling with bladeflurry dual rapiers mostly up to merc dryed lake. Then we switch out to hiltless sword cyclone. Than it's up to you how fast you can become strong enough to flick constantly. I don't recomend flicker and switching to terminus before you atleast cap out you resistances because it's a way to die horribly. Be careful though cycloning with hiltless can be pretty painful at the start you need leech nodes and vaalpact to start that. You can check my character profile for now it has my leveling tree. I'll add updated tree tommorow was a little busy farming, huh. Also profiles of my raiders can give some insight in leveling and more lategame builds. They are a bit different than on the posted screen.